Saratogians are encouraged to take a coat if they need one, or leave a coat if they want to help. The coat exchange outside Fingerpaint in Downtown Saratoga. 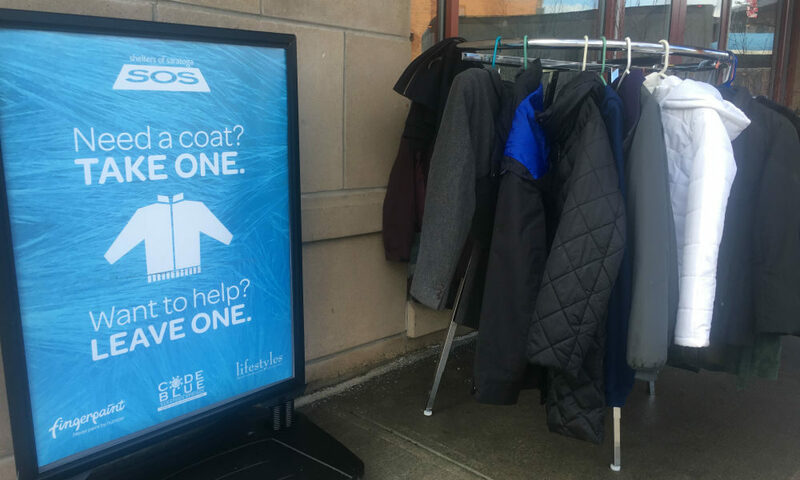 It was kind of ironic that on the warmest day so far this year—a day when many strollers in Downtown Saratoga Springs left their jackets at home—a coat exchange appeared on the sidewalk outside Fingerpaint, on the corner of Broadway and Division Street. The coat rack popped up on Tuesday, February 5, with a blue sign next to it reading “Need a coat? Take one. Want to help? Leave one.” Of course, the two-day, 50-degree, midwinter “heatwave” was fleeting: By Wednesday, temperatures had dropped back into the 20s. Regardless of whether or not Punxsutawney Phil’s prediction of an early spring on Groundhog Day turns out to be right, Saratoga’s surely in for many more frigid stretches over the next few months, and that makes the presence of the coat rack that much more valuable to the community. How did the coat exchange come to be? Fingerpaint has an ongoing partnership with Shelters of Saratoga’s (SOS’) Code Blue Saratoga, a program that provides emergency shelter to homeless Saratogians from November 15-April 1. (Fingerpaint owner and founder Ed Mitzen has been advocating for a permanent facility for more than two years.) “The stars aligned perfectly for this project,” said Rosemary Riedhammer, Director of Development and Marketing at Code Blue. It all began with Code Blue Executive Director Karen Gregory, who saw a social media post about another community’s coat swap. Simultaneously, a boutique in Lake George reached out to SOS offering to donate coats to Code Blue. “Before we knew it, we had a coat rack donated, we had a sign made and lo and behold, it’s out in front of the building today!” Bo Goliber, who heads up Fingerpaint’s philanthropy efforts, told saratoga living on Tuesday. If all goes as planned, the coat rack will be up for the rest of the season. Goliber noted that the biggest obstacle facing the rack project will be keeping it neat and functional, which may be a challenge if the rack gets overcrowded with donations. To help prevent this, Fingerpaint asks that people only bring one or two coats at a time. Riedhammer added that this coat exchange is for anyone who is cold or wet walking by. She says she hopes that these coats and the sense of community spirit they foster will help bring warmth—physical and otherwise—to the citizens of Saratoga all winter long.